Apple is starting to clamp down on app reskinners by making changes to the App Store's search ranking algorithms. That's according to research conducted by ad network Tapdaq, which found certain apps and developers have seen a significant drop in daily app sessions. 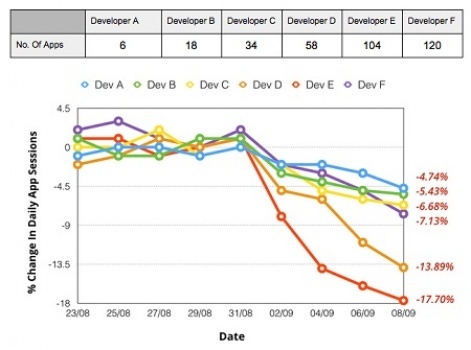 After collecting app session data from five developers of differing size and influence, Tapdaq found that developers with more apps have seen a notable decrease in app sessions. However, Apple isn't strictly punishing those developers with more apps to their name, otherwise huge companies like EA would be driven off the App Store. Instead, Tapdaq's co-founder and CMO Dom Bracher has theorised that Apple is actually targeting developers who are seemingly mass-producing mediocre apps, with the Cupertino-giant analysing user reviews to sort the wheat from the chaff. Bracher also believes that, in order to fight back, reskinners should aim to improve the quality of their apps by focusing on getting large quantities of good user reviews; improving the overall quality of their apps; and finding, leveraging, and building strong user communities. “Having analysed data on over 10 million app sessions from 6 different indie reskinners, the evidence certainly suggests that [Apple is hardening its stance on reskinners],” explained Bracher.